In my previous article, I had described a much about Templates and also write about 30 Best AdSense, SEO Optimized, Responsive and Premium Blogger templates. Here in this article, I am going to explain how you can change your Blog’s template to any custom template. Why do we want to change the default template with a custom one? Most of the Bloggers change the default template with a custom template for a lovely and engaging design and layout of their blog. But there is one more reason due to which you should change your default template with a custom template. When the default templates were designed the blogging or internet was not much popular and there were not many phases of SEO but now if you want to rank high and get good traffic then your template must be responsive, SEO optimized and user-friendly. This is the biggest reason for changing the default template of Blogger. When I had started my journey of Blogging I used the default template of Blogger for a long time and was thinking how other websites and blogs are designed and how can I do same. Then I come to know it is as easy as to make a cup of tea or much easier than it. We just need to download a custom template from Google and upload that template to our Blogger blog, that’s it I had changed the template. Now I am going to describe you about this. For the best user experience of your readers, it is very necessary that you choose such a template which matches your niche as well as the needs of visitors. 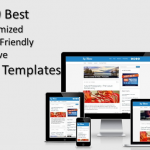 Below are some features which you should see on before you download any template. The template must be responsive. Loading speed must be good. It must be SEO optimized. Design and layout must be simple and attractive. The color of links in blog post must be unique so that your visitors can understand where you have inserted a link. Navigation system must be user-friendly and responsive. There are two different methods to chagne Template of your Blogger blog. The purpose of the both methods is same but the procedure of both of these methods is little different, that’s why we will discuss both of the methods. First, you have to download a custom template for your blog. You can choose your desired template from here. 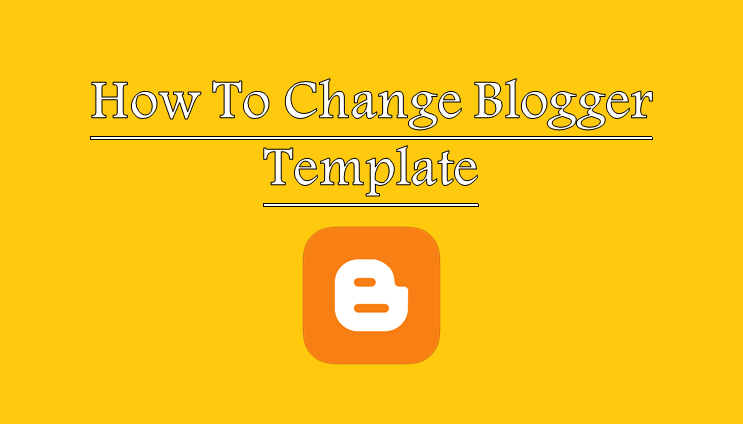 Pasting the custom template code to Blogger’s editor is the easy and quick way to change your template, I also use this method whenever I want to change the template, moreover, it also removed any custom widgets added to your blog. Login to your Gmail account associated with your Blogger blog. 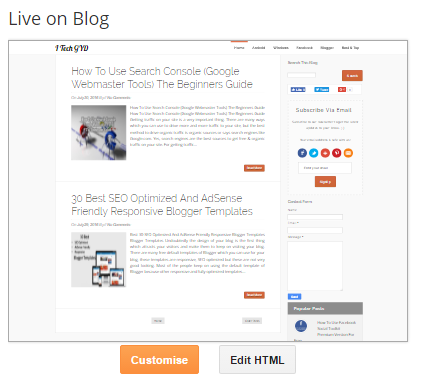 Select the blog whose template you want to change and click on Template button. Under the template page click on Edit HTML button. Blogger’s HTML editor will be loaded here you can see the coding of your blog’s template. Press CTRL + A (After clicking inside the editor) to select all the text and CTRL +X to cut the template code. Now extract the downloaded template and open the XML File from the downloaded template in any editor (I am using Notepad + +). Press CTRL + A to select all the code right click and select Copy option. 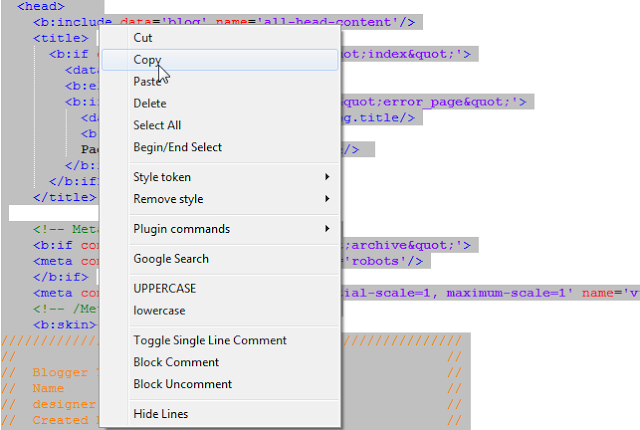 Open the Blogger’s template editor and replace the previous template code with this one. Finally, click on Save template button and that’s it you have successfully changed your old template. Uploading the custom template to your Blogger blog is also easy method but it is little long than the previous one. Backup is very important it helps us to overcome those problems which may occur accidently so that your blog’s design is not affected. Login to your Gmail account, choose the blog whose template you want to change, click on the Template option from the menu. Then click on the Backup / Restore button at the top right corner of the page. 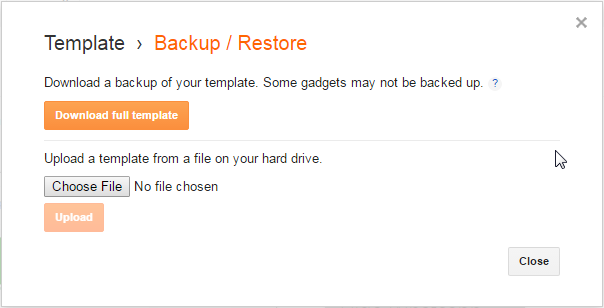 Download your Old Template as a backup by clicking on Download full template button. Repeat the backup process and click on Back / Restore button. Now instead clicking on Download Template click on Choose File button and windows explorer will get opened, select the XML file which you had downloaded and click on Upload button. That’s it you have changed your Blogger template with a custom template. To see how your blog looks click on View Blog button and enjoy the new design. Choosing template is not enough and your job will not end after choosing the template. The main job starts after you choose and set your template on blogger. Every template has default settings which are suitable for users. So you have to customize it for your users. You have to add necessary things in your template and remove the unwanted things. The customization of template is very easy. You’ll face issues for the 1st time but not the 2nd time because till then, you would be go through these changes and can change any template design easily. Read the above guide and try these setting, i know you’ll enjoy by doing changes on your blog. We covered every aspect but you can change your blog design according to your desire. Everyone has its own choice and way of thinking. We just clear the basics changes, the advance will be done by your self because we don’t know your choice therefore we leave all up to you. But we have covered such things, that can help you to take your blog design to next and advance level easily. 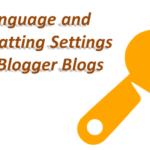 Just follow the above steps and implement these settings in your blog. Many newbies wants to change their blog design but because they have no experience in it so they are unable to do that. But of you are one of them, i am sure that these settings will help you out. So, if you like this guide, so share this post with your friends and help them to change their blog design. Good Luck.